Robin and Bina Williamson work together so well because they create a perfect balance of voices. 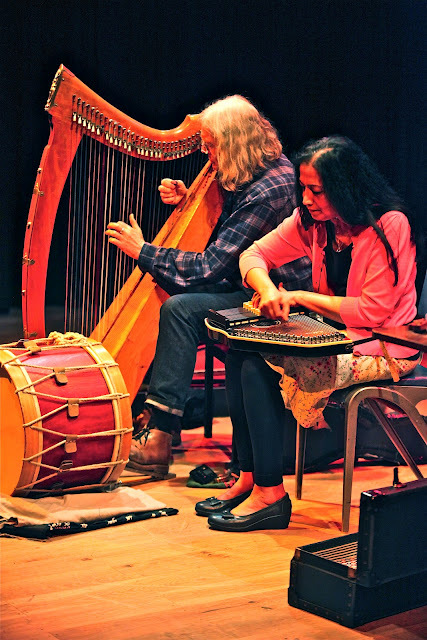 They draw on a wide variety of original and traditional songs, stories and music from Celtic, English, Indian and Old Timey roots; celebrating the turning year and the mystery of being alive. Robin is legendary worldwide as musician, storyteller and writer. He has forefronted many genres over his 50 year career. Bina is an inspired and gifted singer-songwriter and multi instrumentalist in her own right. She has a hauntingly sweet melodious voice. Both artists are synonymous with The Incredible String Band. 'An evening of enchanting entertainment.' Edi Stark, Radio Scotland,Celtic Connections. 'Pure beauty through simplicity.' Robert Plant.